On June 6, 2014, the 70th anniversary of D-Day and the Battle of Normandy will be celebrated. I have always been interested in this battle and the preparations taken to ensure its success starting with the failed raid on Dieppe. I guess the book "The Longest Day" by Cornelius Ryan sparked my interest and I have watched the movie by the same name many times. Please show your stamps of this battle. 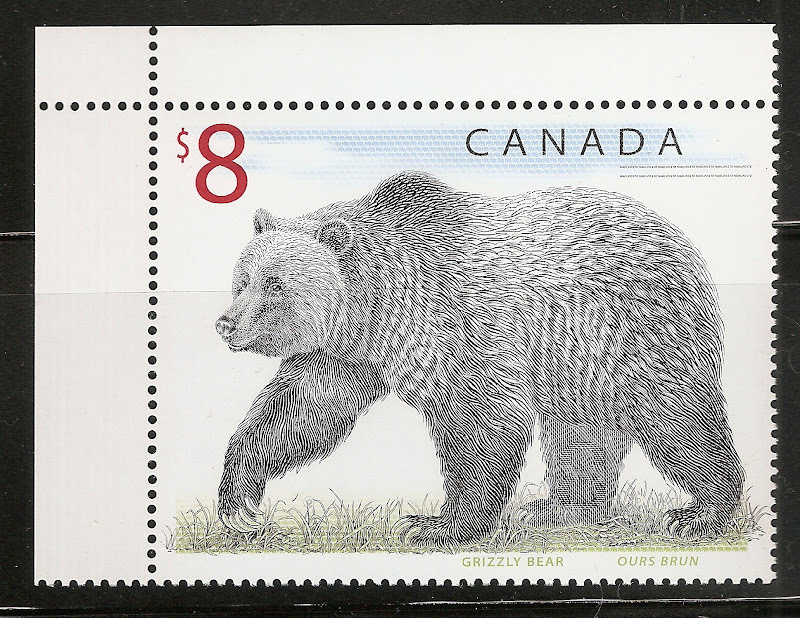 Canadian stamp Scott #2043 issued on Jun 6, 2004 celebrating the 60th anniversary of the landing of Canadian forces on the beaches of Normandy. It depicts the initial landings on Juno beach. Canadian stamp Scott #1537 issued Nov. 7, 1994 is one of a set of four stamps depicting WW2 events during 1944. This particular stamp shows some of the 15,000 Canadian troops attacking Juno beach. Guernsey SS Scott #530 issued Jun 6, 1994 depicting Canadian Wing Spitfires flying over the Normandy coastline. Marshall Islands Scott #485 to 488 depicting D-Day landings in Normandy, US P-51Bs and British Hurricanes, German gun defences and allied amphibious landings. Jersey Scott #670 issued June 6, 1944 depicting allied airborne forces in gliders headed for Normandy drop zones. Jersey Scott #671 issued June 6, 1944 depicting the allied fleet off the coast of Normandy. Jersey Scott #672 issued June 6, 1994 depicting British troops landing at Gold Beach. Jersey Scott #673 issued June 6, 1994 depicting British troops landing at Sword Beach. Jersey Scott #674 issued June 6, 1994 depicting Spitfires flying over the Normandy beaches. Jersey Scott #675 issued on June 6, 1994 showing the invasion map. this is an area of history that has always drawn my attention for a number of reasons in many areas..
Great Britain Scott #1562 issued June 6, 1994 depicting air crews reloading bomber. Great Britain Scott #1563 issued June 6, 1994 depicting HMS Warspite bombarding the Normandy coast. Great Britain Scott #1564 issued June 6, 1944 depicting British troops at Gold Beach. Great Britain Scott #1565 issued June 6, 1944 depicting British troops at Sword Beach. Great Britain Scott #1566 issued June 6, 1944 showing British troops advancing inland. I don’t really have much to add that hasn’t already been put up. On the other hand, I don’t want to be left out of remembering one of the finest sacrifices of the Greatest Generation. So here’s the one item I can contribute from the US WWII series. This is the 1944 block of 10, issued on the 50th anniversary of D-Day. 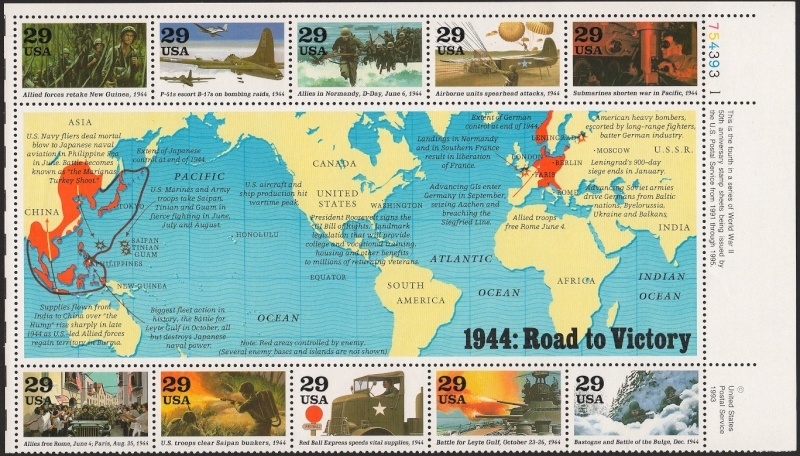 The D-Day stamp is the middle stamp in the top row. Scott US #2838(6Jun1994), World War II, 50th anniversary. 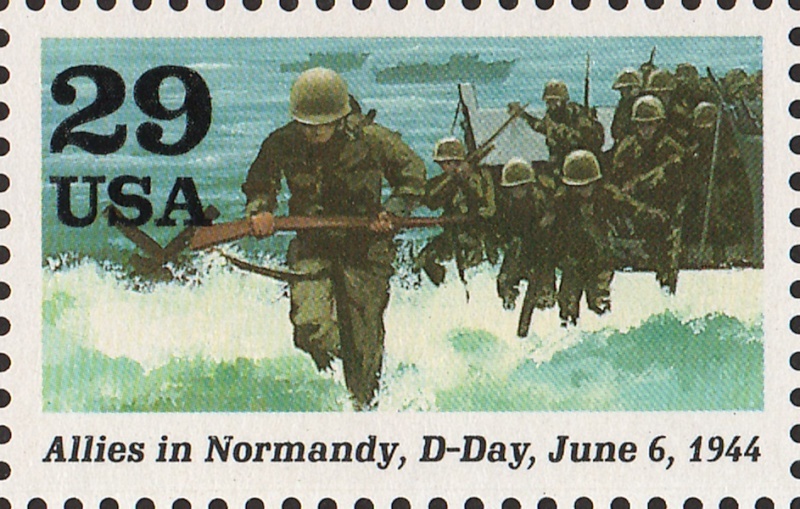 Here’s a close-up of the D-Day stamp. Palau Souvenir Sheet Scott #326 issued May, 1994 depicting 10 scenes of the allied invasion of Normandy. I completely forgot about that one! Thanks for showing the Palau pane!